In our Filipiniana library is a treasure trove of images of Philippine life, history and culture from the 15th century to the early seventies. The 4″ x 5″ black and white photos include reproductions of engravings, lithographs, drawings, and other modes of visual representation, as well as original photos gathered and annotated by the Ayala Museum research department over several years. We have over 35,000 photos and are expanding the collection. The Filipinas Heritage Library is a resource center without walls. Retrato is our way of bringing Philippine images, and the stories they tell, to their true home: the hearts and minds of people all over the world who are eager to know the Philippines. We particularly want the images to be a learning resource for students of Philippine history, arts, and culture. From stockroom to cyberspace. That’s how far our photos have come. Retrato traces its roots to a small stockroom in the Insular Life building and, later, the Filipinas Life building on Ayala Avenue. There, from 1968 to 1974, a research team worked with sculptors, painters, and craftsmen to make 60 dioramas for the proposed Filipinas Foundation museum. Their task: to render Philippine history, from the Pleistocene era to contemporary times, in visual form. Since the dioramas had to be accurate to the last detail, the team combed public and private libraries for models of historical figures, architecture, costumes, landscapes, and other visual requirements. The archives thus gathered under one roof visual resources culled from the country’s foremost collections of Filipiniana. The archives eventually found a home in the Ayala Museum, where the dioramas are now housed as a permanent exhibit. In 1970 historian Carlos Quirino, the first Museum director, organized photo-research teams to document historic structures such as churches, old houses, public buildings, and town plazas, as well as indigenous peoples, art exhibits, rites, and festivals. The collection grew. A filing system evolved. The photos were mounted and annotated; slides and films were made available for viewing. In August 1996, the centennial of the Philippine Revolution of 1896, the collection was moved to the newly opened Filipinas Heritage Library. Around July 1998, Emelina S. Almario, the first director of the Library, formed a team to lay the groundwork for digitization of the images. She named the project Retrato. How does one put some order to a collection consisting of thousands of images? There are no hard-and-fast rules, as in the case of books. Because their appeal is to the senses, there is a good deal of subjectivity at play when we look at pictures. They thus tend to resist classification. In the course of our readings, we discovered this bit of wisdom on classifying images: First, you should know what you have; then you figure out the most appropriate classification scheme for what you have. This made perfect sense. So we set out on a road that we hoped would take us where we needed to go. 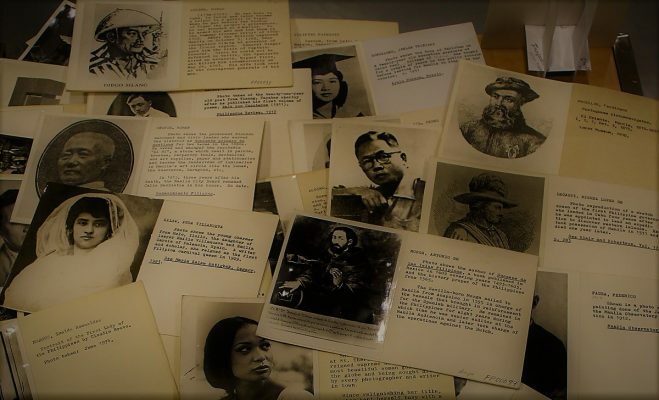 We surveyed a sample of almost 10,000 4”x 5” photos which the Ayala Museum Research Team had mounted on 5”x 8” cards. It helped that these photos had notes on them. Along with the images, these notes gave us an idea of the range of subjects we were dealing with. Then our Senior Researcher, who had been with the collection for the longest time, made a tentative list of subjects, in alphabetical order, derived from the Sears List of Subject Headings, 14th edition, 1991, ed. Martha Mooney. Serendipity led us to 18 Generic Headings. For discipline in classifying, we defined the scope of each Heading. AR Architecture Photos of habitable structure, such as houses, public buildings, forts and the like. CE Celebrations and Observances Photos of fiestas and festivals, rites and rituals, custom and manner. CH Churches and Church Art Photos of churches, including church objects, patios, parish convents and cemeteries all over the Philippines. CL Clothing and Adorments Photos foregrounding articles which clothe or adorn the body, including everyday wear, costumes, and accessories. FI Filipinas Circa — Period photos of various aspects of Philippine life. FP Foreign Profiles Photos of non-Filipino personages in various fields. GE Geographical Photos highlighting landmarks, sights, and places of interest in various provinces and cities, including land and water forms, such as mountains, rivers, and the like. HI Historical File Photos of milestones, chapters, and events in Philippine history. IN Industries Photos on the production or manufacture of something by hand or machine; also photos of products. ME Memorial Photos of monuments, markers, and other structures commemorating a person or an event. PA Plant and Animal Life Photos of plants, leaves, flowers, and fruits of various classes; photos of animals of various classes. PE Peoples Photos of the peoples of the Philippines–indigenous, Christianized, and Muslim-influenced–and their material culture. PP Philippine Profile Photos of Filipino men and women in various fields of endeavor. PW Public Works and Facilities Photos of structures built for public use–e.g., roads, bridges, and similar structures. RE Religious Images Photos of likenesses of religious personages. SC Special Collections Sets of photos of special interest or from a common source. SS Special Subjects All other photos. Our second task was to determine the data, or fields, that should go with each image. We made a tentative list of fields we thought would be helpful to researchers. When a colleague told us about the SEAiT (SouthEastAsian images & Texts project), we checked the fields we had listed against the SEAiT list. Finally we came up with 17 fields for our data entries.